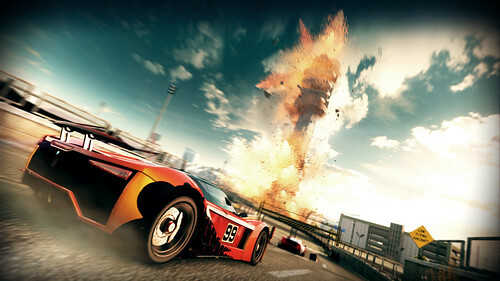 We’re excited to announce that the Split/Second demo is coming to PSN for PlayStation 3 tomorrow! To prepare you for the action you’ll be experiencing, I wanted to provide you with a bit more information about the demo which takes place in our “Airport” location. After we had such a great response from fans who played this level at E3 2009 and both Penny Arcade Expo events in Seattle and Boston, we thought it would make a great demo to release to everyone in advance of the game. 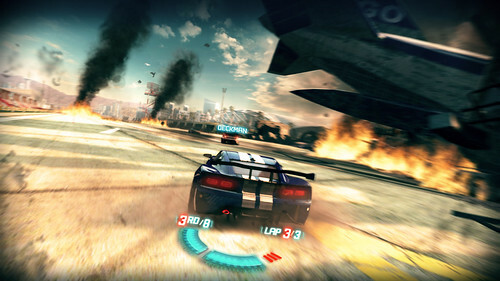 In Split/Second, you build up your power meter through skilled driving techniques and then trigger what we call “Power Plays” to take out opponents and alter the track. All this takes place in the premise of a huge global broadcast event where you play as a contestant trying to win the season championship. The airport track features some incredible moments that YOU can trigger – including a navigational radar dish that explodes off its base and a tram that slams into a parking structure creating some real shock waves on the track. There are also some other really huge Power Plays you can activate like taking down the airport control tower to clear a path onto the runway which provides access to a huge remote-controlled jumbo jet you can use to take out your competitors. Overall, there are three major route changers on the course. Can you find all of them? Download the demo and then go to our official Facebook page to let us know what you think of it. We also challenge you to take a photo of your times in the demo and post your score so we can determine who is the fastest on the PS3 demo. We hope you’ll be as addicted as we are to try new things and attempting to shave down your time. We were proud to have Split/Second selected for the Game Critics Awards last year for Best Racing Game of E3 and we have already started receiving some great reviews from the press. The game was developed by the incredibly talented team at Black Rock Studio, creators of 2008’s extremely fun off-road racing game, PURE (which also won the Best Racing Game of E3 2008). We look forward to hearing your thoughts on the demo and hope you enjoy Split/Second when it hits retail shelves on May 18th. Yeah LBP2 is going to be awesome!! I’ve been wanting to see this game in action. Seems like Burnout meets Michael Bay! Can’t wait to boot it up. Crappy multi-platform junk dumbed down to run on the Xbox 360’s wimpy graphics hardware and last gen 7 gig DVD format. GT5 makes this look like a Wii game. 75 percent of the BluRay disc is empty. And the insane power of the PS3’s sitting idle. Why are you even bothering to shovel this junk? Really looking forward to picking this up next week! Will this title be supported post launch with DLC packages? Seems to lack the upper end speed of BO and you don’t feel ‘connected’ to your car…something is floaty about it. Also, the crash animations have a lot to be desired…hopefully they are cleaned up for launch. Good luck with your game though. Looks pretty cool. I like the art direction. I’m a big driving game fan, looking forward to giving this a test drive. This and GT are completely different genres. Compare it to Grid or BO if you want to make comparisions imo. BO? What game is that? BO = Burnout (stupid)……Pure was a fun demo, and that’s prolly all this will be. I’d rather spend 8 dollars on that psn game with a platinum, at least that game is a PS3 exclusive. Really, you are going to resort to name calling? How about you try growing up. It isn’t my fault you idiots are giving a single word two initials. you kids and your complaints about graphics crack me up. the differences are so minuscule but they seem to be the deciding factor to alot of you. gameplay beats graphics all day long. not saying this has great gameplay, honestly it sounds pretty dumb. I am really looking forward to this game…I loved Pure! Will the game be downloadable? I’m still on the fence about this game. I will be checking out the demo tomorrow. I hope it’s great! I already downloaded the demo from the EU store and I had a blast. I’m not even the biggest racing fan but the demo alone brought a purchase into consideration seeing as how this game wasn’t on my radar AT ALL. @13…Sorry…its common (at least amongst my friends) with Burnout to use BO and then a third letter to signify the title (thus Burnout 2 is BO2 or Burnout Legends is BOL…since there is only one BO for the PS3 I didn’t say BOP…sorry if not clear. You can compare it to gt5 all you want to but is gt5 out yet ? one’s a simulation and the other an arcade game – Graphics aren’t what makes a game fun anyway . Burnout might not have AAA graphics but it has AAA fun factor . If the reviews are good, i’ll give it a shot. Too many other games on the PS3 i’d rather play like 3D Dot Game Heroes, Red Dead Redemption, and Modnation Racers. Next racing game for me is GT5 and nothing else. Can Mitch please explain why the demo launched 2 weeks ago on MS’ console and only now PS3 owners get to try it? Even though I thought the demo was good, it would’ve been MUCH better if the game was running at 60fps. Played this at PAX in Seattle and the game surprised me. I myself figured it for another “Burnout” type racer. Well in a way it is, except the destruction is in your hands and not your car. It was a lot of fun to play and even then it ran really smooth and looked great. If you liked “Burnout” you’ll like the twist this game takes on the destruction. Need to try it out to see what I mean. Since GT5 is unlikely to ever see light of day I might go for this 1 when its released on something other than PS3. I’m so sick of sonys idiotic downgrades and fanboi trolls like legendary phoenix. Sony needs to clean up its act if it wishes to continue selling games. So now I am an idiotic fanboy troll eh? When all you do is come here, and in almost every post, post your complete and total BS about the “downgrades” learn the meaning of the term before you start tossing it around. they’re planning future dlc as well . This is a really fun demo; definitely gets the blood pumping. I’ve played the 360 and PS3 one (UK Store) and they both play flawlessly. Problem is: this is releasing along with Blur and along with Modnation. It’s tough to buy a $60 and support game devs but when three games are coming out in the span of two weeks that can scratch that one arcade racing itch of mine… I’ll need to somehow just buy one and look into playing the other two later. Unfortunate, but the release date timing for the three games (S/S, Modnation and Blur) is just a tremendous fail by those publishers. Great. Now where is the Tecmo Bowl Throwback? Need I list more here? It’s been proven the PS3 can do graphics equal to the Xbox360, and for exclusives it can do even more. I’m not one of the graphics nut jobs who thinks that all PS3 games should look just like Killzone2, or Uncharted 2. But they do matter. Just not in the way it dose to fan boys. Most of this is just rabbid fan boy bull crap right now developers have found ways to use the PS3 to make it look just as good for Multiplatform titles as the Xbox, on top of that many developers are saying thanks to the Cell CPU they can do twice as much work on the PS3 then on the Xbox360. Un compressed textures, and sounds, plus Cutsceens that are uncompressed, along with the fact that half of all new Multiplatform titles for the end of this year, and the start of next are saying that they will run better, and have more detail on PS3. I played the demo when it launched last week on the EU PS Store and i’m looking forward to this one, really fast paced and a cool concept for an arcade racing game. #32 I am with you….give us Tecmo Bowl Throwback!!!!! Looks fun, I will check it out. Thanks, but I’m still buying the game used from Gamestop since you decided to delay the demo for PS3 users. If you can’t treat your platforms equally, I’ll support Gamestop with my dollars instead. It looks interesting, so I’ll check it out. However, nothing can stop my excitement for ModNation Racers! Already played the EU demo… it was fun. cant wait for this!!! Looks great!!! I just hope it is 2 players and I hope it has online play. I just hope it is 2 players and I hope it has online plays.